Approximately, 1.5 million high school students are hazed each year, according to the National Collaborative for Hazing Research and Prevention. 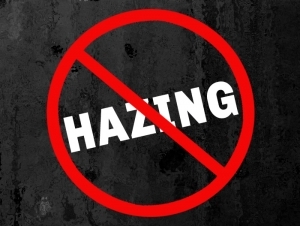 And 47 percent of students enter college already having experienced hazing, which is defined as any activity that humiliates, degrades, abuses, or endangers an individual, regardless of his or her willingness to participate. However, this activity is not just contained to high school and college campuses. S. Marlon Gayadeen, assistant professor of criminal justice, has studied hazing for more than a decade. While earning his doctorate in sociology from the University at Buffalo, he wrote his dissertation on anti-hazing legislation. He noted that hazing practices occur everywhere from the military to athletic teams to businesses. Participants who want to be a part of something go along with whatever initiation is required, however unsavory. Over the past decade, hazing practices have seeped into organizations you wouldn’t expect, he said. In that case, drum major Robert Champion died following a 2011 initiation ritual that involved walking down the length of a parked, darkened bus as 15 to 20 band members pummeled him with fists and instruments. The student considered to be the ringleader was charged with manslaughter and sentenced to four years in prison, and the band was suspended for more than a year. Despite well-publicized horrific stories such as this one, the number of incidents on college campuses has actually decreased over the past decade. Gayadeen attributes this more to declining membership in Greek organizations than anti-hazing laws. Although Illinois adopted the first anti-hazing law in 1901, the majority of states adopted enacted legislation in the 1980s and 1990s. Currently, all but six states have some kind of anti-hazing legislation on the books. He cites two main reasons why the laws have not served as the intended deterrent: Hazing is largely not viewed as a felony offense (unless it results in death) and hazing incidents tend to be handled by the institution in which they take place. At the same time, he said, it’s hard to gauge exactly how severe the problem is because hazing, like many other crimes, is underreported. Sometimes students don’t even realize they’ve been hazed. “The number of reported hazing incidents is a fraction of what truly exists,” he said. And the practice is far from being eradicated. After joining the Buffalo State Criminal Justice faculty as a lecturer in 2005, Gayadeen moved into the role of assistant professor in 2012. Since then, his courses have included Race, Ethnicity, and the Administration of Justice; Crime and Substance Abuse; and Criminal Justice Theory and Ideology. He earned a doctorate in sociology with a focus in organizational sociology from the University at Buffalo in 2012; a master’s in criminal justice from John Jay College in 2003; and master’s in liberal studies from the University at Albany in 1998. His research interests include hazing, minority membership in mainstream Freemasonry, and police humor.